Although our University enjoys the benefits of a culture promoting equality and inclusivity, UNCG’s reputation for embracing diversity as an educational foundation was constructed over decades by student and staff advocacy. 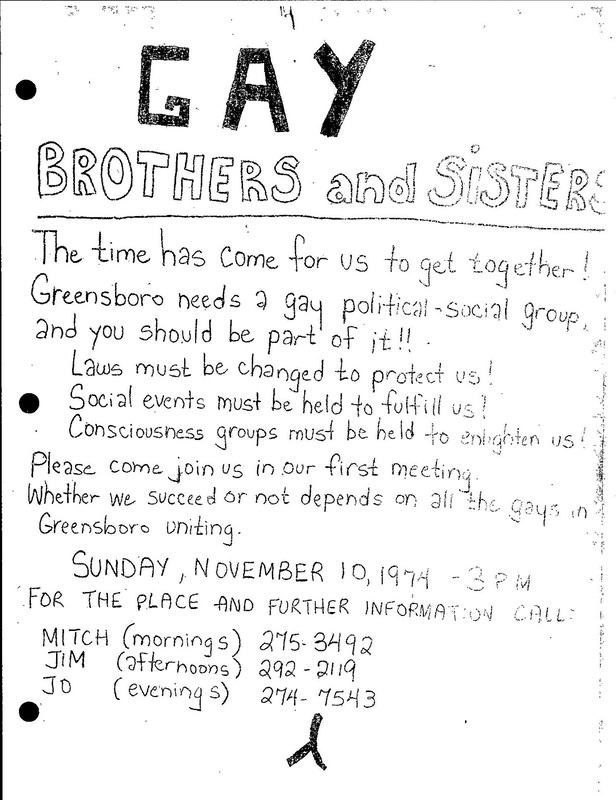 Among the more hidden stories of Civil Rights struggles at UNCG is that of the formation of a university-acknowledged student organization for LGBTQ students. As part of the Safe Zone Lunch and Learn Series, Stacey Krim is presenting on the LGBT history of UNCG. Selfie! Leah is pictured on the right, next to her conversation partner, Ali, on the left. She signed up for the Conversation-Partners Program at the Diversity and Global Engagment Expo at UNCG. I had a grand time at the Diversity and Global Engagement Expo, held at UNCG Jackson Library. There was food, discussion, prizes, lively chatting and socializing- it was a fun, and educational event. Everywhere you looked, there was multicultural learning going on! Needless to say, I was excited to attend the event. UNCG is so diverse, and that is something we take pride in. The UNCG community, along with the international and exchange students I have met here over the years inspired me to study abroad in England last semester (it was an amazing, eye-opening experience!). Engaging with others who are different from us is something that we do not always stop and take the time to do, so it was really nice to have an event like this to bring us all together. One of the most exciting parts of the event was, of course, the food! The food came from different countries- candy from Turkey, sweet plantain chips from Costa Rica, and my favorite- coconut biscuits from Jamaica. Wow, they were good. I found out where to purchase those sweet, crunchy biscuits. There were talented musicians playing beautiful songs from instruments that I have never seen. There were well decorated tables representing different clubs for different ethnic groups and countries. I saw some friends manning the tables and said “hello!” The International Society Association table and The Office of Multicultural Affairs were represented. The International Programs Center had a study abroad table (I felt a sense of pride at being able to say "I've done that!"). I also saw the Interlink table, which caught my eye. To describe briefly, Interlink is a program that our university has for internationals who take English courses to improve their English. I learned more about Conversation-Partners Program - something that any UNCG student can sign up for if they want to make a new friend and help them practice English. I immediately signed up and have been partnered with a student from Kuwait, named Ali. I enjoy our often culture-centered conversation. Also, he is even teaching me some words in Arabic! We have only met once so far, but already it has proven to be a fun, worthwhile experience. Cultural learning is fun and exciting, and I am so happy that Jackson Library held this event. They also did a great job of promoting the event which led to a great turnout. The library is also a place where you can read about a different country or rent a foreign flick. I am a proud student worker here in the library, and I want to recognize the fact that the library staff who headed up the event did a great job! There are also so many people, organizations, and clubs that took their time to be there and inspire others. I am so grateful that UNCG has a diverse and globally engaged community – it is respectful, caring, and exciting. I am proud to call it my community. The history of our University represents a microcosm for the struggle for African American civil rights. In celebrating African American History Month, join Erin Lawrimore as she discusses the transformation of the State Normal and Industrial School for white women into one of the most diverse campuses in the University of North Carolina system.